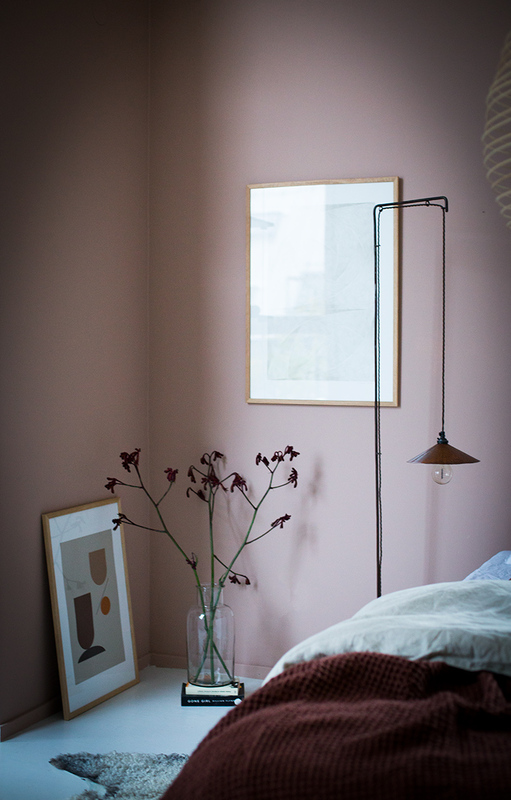 The accent wall is painted in Jotun Lady Pure 'Blushing Peach' which I think makes the room feel so cosy, and warmer too (something of a necessity in the Swedish winter!!). 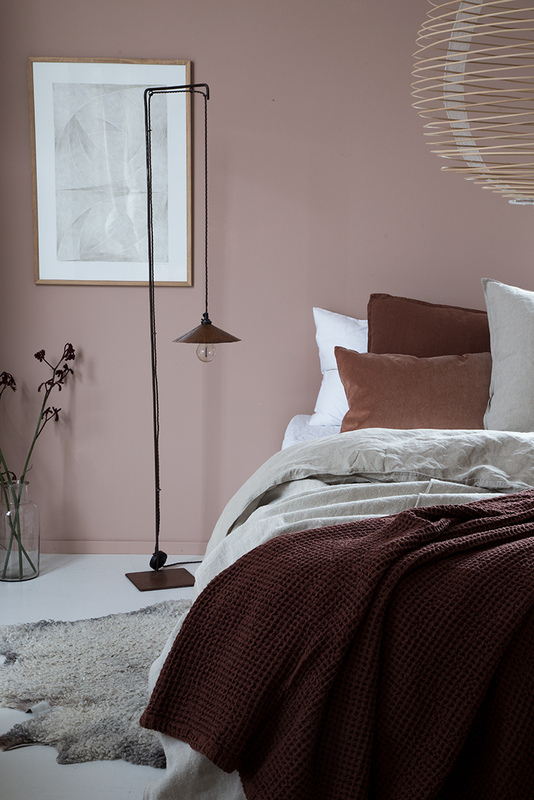 It also makes a great backdrop for deep rust and chestnut hues as well as lighter off-white / wheat tones - thank you so much to My Scandinavian Home interior designer / stylist Gen for finding this colour for us! The big 'ole waffle throw is from Granit. I love a big old fluffy bed with tonnes of pillows, cushions and throws, it makes it look so much more inviting don't you think?! The white pillow case is from John Lewis, the off-white linen pillow is part of a bed set from H&M Home and the dark rust from Granit. We were looking for prints with a relatively calm feel. I'm so happy with the limited edition New Form 4 print by Riikka Kantinkoski and Noon print by Kristina Krogh from the The Poster Club. The bedside lamp was handmade by someone in the UK years and years ago, and sadly (as far as I'm aware) is no longer made. When we moved in, we couldn't find shelves to span the height of the four metre wall that would also hold a load of heavy objects. In the end my husband designed and built the shelves himself! If you look closely there are support brackets on the back and side wall for each shelf and then they are also suspended on a strong wire which runs from floor to ceiling. If you've got any questions about it just give me a shout (the man's super proud of them so he loves to help anyone looking to do the same!). 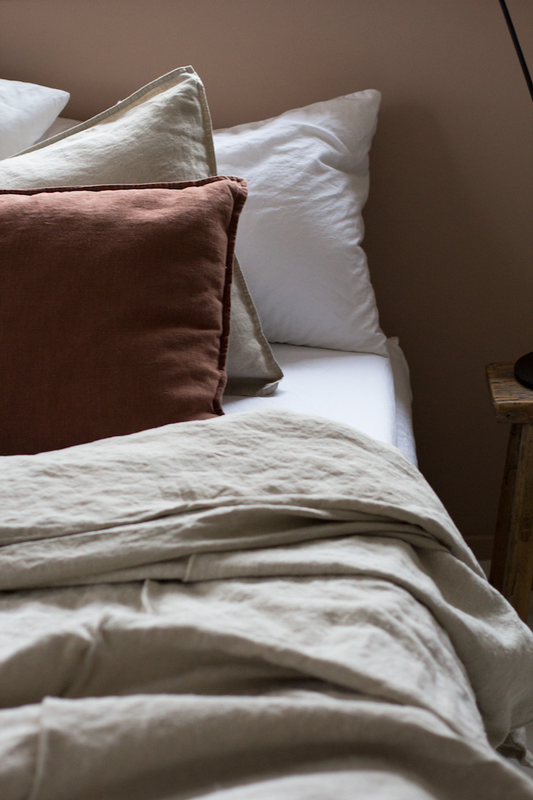 The four metre long Washed white linen curtains were made-to-measure by small, independent online shop notPERFECTLINEN. These guys also made the curtains in my window nook and are so wonderful to work with (they ship worldwide too!). 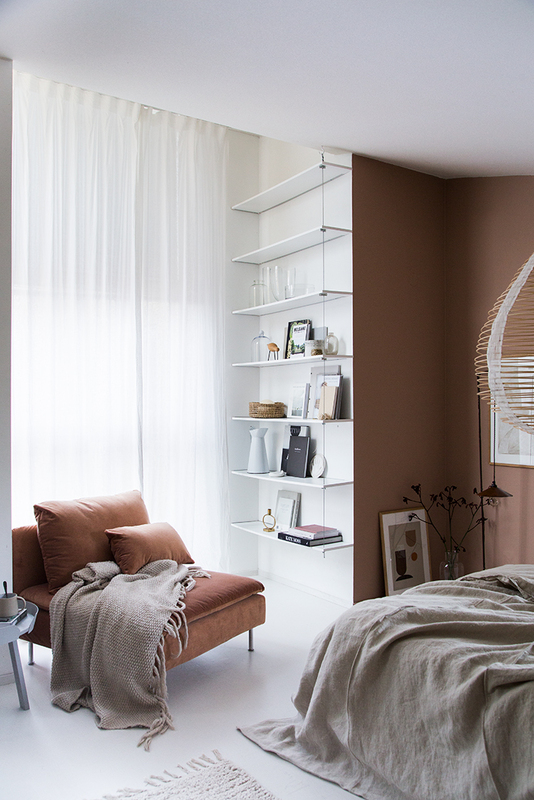 The pendant over the bed is the Feriel drop light by Paris Au Mois D'août - it really pulled the whole look together. I absolutely love it (and it's as light as a feather too). If I've missed anything - give me a shout below and I'll be happy to advise! I hope you like the make-over as much as we do! 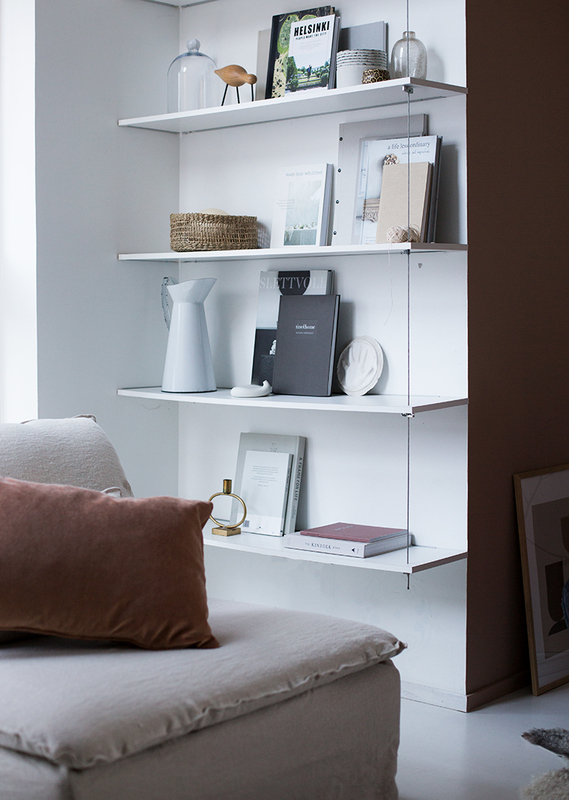 Photography / Production: Niki Brantmark - My Scandinavian home. 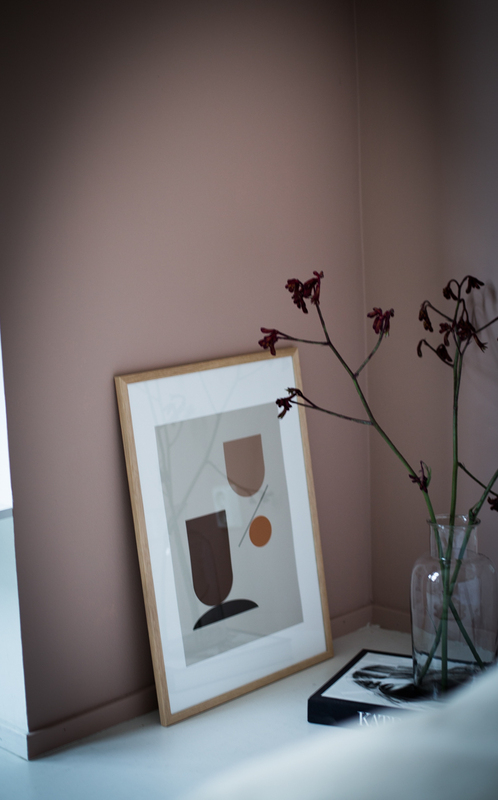 Interior design / styling - Genevieve Jorn. Some of the items were generously gifted from companies across Europe - thank you! Where do you keep your clothes?! I always wonder this when I see lovely pictures of calm bedrooms. Are yours kept somewhere else, or do you accept that you have to have the storage but not count it as part of the overall look? I love your style, just wonder how to incorporate the more mundane parts of living! I love the color pallete! What a beautiful makeover! I love the paint colour. PS - Last night, I finished reading your new book - Lagom - we already do some of the things you suggest, and will incorporate more! After all, Cnaadians and Swedes share a lot in common (not just hockey!) ! It's a lovely room, but do you ever worry about hitting your head on the pendant? Love this room, so well designed! thank you for sharing. This might seem like an odd question, but I've been looking for a glass vase, similar to one you have on the floor of your room. Would you mind telling me the source of that? Frustratingly my 'reply' isn't working in my comments section so I hope to answer everyone here -hope this works for now! - @Bianca - lovely to hear from you! Happy you like it! - @Annicles - we are blessed with SO much storage in our house. The wardrobes run along the opposite wall to the armchair (you can catch a glimpse of these in the previous make-over post)and I also have a very small walk-in-wardrobe downstairs. I'll make a note for next time to show more of this to make the feature more practical - thank you for pointing out! @Mina - this is not a strange question at all, it's a beautiful vase! it's from the Danish brand Nordal. I really like the floor lamp. It's a shame that they don't make them anymore. Its vertical axis balances perfectly with the steel wire that's holding the shelves that look great by the way.